People inspect the damage at a site hit by airstrikes, in the rebel-held area of Aleppo's Bustan al-Qasr, Syria, April 28, 2016. About 30 airstrikes by Syrian government warplanes and helicopter gunships hit rebel-held areas of the northern city of Aleppo on Saturday, killing at least five people. According to the Britain-based Syrian Observatory for Human Rights, nearly 250 civilians have died in shelling, rocket fire and air raids in the contested city since April 22. Among those killed were at least 50 people in a hospital that was hit in an airstrike. The surge of violence came as the International Committee of the Red Cross warned that the intensification of fighting could bring many people closer to a humanitarian disaster in Aleppo, Syria's largest city and former commercial center. U.S. Secretary of State John Kerry will travel to Geneva on Sunday for talks on Syria. The State Department said in a Saturday release that Kerry would discuss efforts to reaffirm a cessation of hostilities throughout the country. Kerry called the U.N. envoy to Syria and the Syrian negotiations coordinator in preparation for the trip. State Department spokesman John Kirby said the secretary made it clear that ending the violence in Aleppo and returning ultimately to a durable, nationwide cessation was a top priority. Kerry also expressed his concern about the Assad regime's continued escalation of the conflict by predominantly targeting innocent civilians. Aleppo was left out of the temporary U.S.-Russian-brokered cease-fire that took effect early Saturday in Syria (2200 UTC Friday). It was set to last for 24 hours in Damascus and the Eastern Ghouta region and appeared to be holding. State Department spokesman Mark Toner said similar truce plans for Latakia would test the commitment that all of the parties made to the initial cessation of hostilities. “This is a recommitment, and it is a test for the Russians, for the regime as well as for the opposition,” he said. 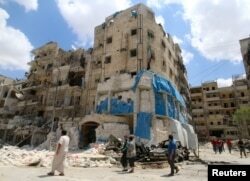 Rebels continued to hit government-controlled neighborhoods in Aleppo with rocket and artillery fire. Similarly, the Syrian government also kept up its bombing raids. More than 80 international and Syrian NGOs signed an urgent statement Friday demanding that U.S. President Barack Obama and Russian President Vladimir Putin respond to appeals by the United Nations to try to stop the bloodshed. From Geneva, U.N. rights chief Zeid Ra'ad Al Hussein said this week's violence in Syria showed a "monstrous disregard for civilians" lives by all parties to the conflict." Rebels demanding the removal of Syrian President Bashar al-Assad and the government troops opposing them control separate parts of Aleppo, and portions of the surrounding province are in the hands of numerous other fighters, including members of al-Qaida and the Islamic State terror group.